What made you want to study memory and learning? I've been fascinated by how people think and learn new things for as long as I can remember. When I was about 6 years old my mom told me that if I learned how to read I could learn how to do or be anything I wanted because I could find a book that told me how to do it. This seemed like a super power to me. The ability to learn and become new things - to go from a state of not knowing and being to a state of knowing and being - just by picking up a few books?? When my mom told me this I pictured something very similar to the scene in the Matrix where Neo opens his eyes and says "I know kung-fu." When I got to college it was a given that I would study psychology to understand more about how this process works. I was lucky enough to find a position as a research assistant in a psychology lab and do an honors thesis that looked at the link between language and memory. As graduation crept closer I was excited to learn that I could apply for graduate programs to study memory. I like telling my students that I liked learning so much I ended up going to school for 9 years to learn how people learn! There are a lot of things I like about teaching - building relationships with students, meeting new people, getting students excited about new things. But I think as a college professor one of the more rewarding aspects of teaching is helping student gain the confidence and skills they need to be successful later on. It's especially gratifying this time of year when I'm talking to seniors about their future plans for internships, jobs, and graduate school. How do you implement learning strategies with your students? The most obvious way that I apply research on learning and memory in the classroom is through frequent quizzing. Each semester I explain my reasoning for the quizzes and provide resources for students to learn more about retrieval practice. Sometimes there is some resistance to frequent quizzes - students will comment both that it's too demanding to have a quiz every day and too easy because then tests aren't worth as much (yes, some students think that they're not learning unless they have one or two high stakes exams that they have to cram for). So there is a bit of an education process about the format of the course that has to happen every semester. In a more subtle way, I try to set up presentations with pictures and text to take advantage of dual coding, provide multiple examples or explain examples in detail, and make connections to previous material more obvious. I'm always excited about new research and new ideas so I'm constantly tweaking classes and projects to see if I can get students more engaged and better prepared for whatever is next for them. Why did you join the Learning Scientists? I was very excited to join the Learning Scientists both so I could help translate the research I know and love to a broader audience and so I could learn more about what teachers are doing in the classroom. In college my research advisor would talk about how cognition research was applied in clinical settings - he called it "cognition in the wild". Since then I've been intrigued by how ideas from the laboratory eventually get put into practice. I use this idea as the basis for an assignment in a few of my classes. I ask my students to find news articles and examples of concepts that we've talked about in class and critique how well the concept was applied once it left the lab and went out into the wild. After a few years it became obvious that there was a real need for better science communication. The ideas and principles that get discovered in the laboratory can take on a life of their own once they get into the wild. Sometimes really important ideas don't even make it out of the lab. To continue with my cognition in the wild metaphor, I also see a need for some ideas from the wild to come into the lab. A sort of catch and release program for best practices. As a researcher, my prerogative is to create highly controlled settings so that I can isolate effects to understand more about how learning works. But learning isn't always happening in those highly controlled settings. Situations that happen in the classroom can give rise to questions that I would never be able to come up with on my own. When there's better communication everyone can benefit from a more wholistic understanding of learning. You recently wrote a book about teaching and learning myths. Why did you write this book and what do you hope readers get out of it? 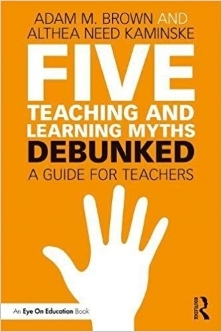 My co-author, Dr. Adam Brown, and I wrote "Five Teaching and Learning Myths - Debunked" to make a useful guide for teachers and teacher educators. Our goal was not to write a textbook that details the nuances of cognition and education research - there are plenty of those. Instead, we wanted to write something that anyone could pickup and immediately see how to apply the concepts we talk about. One of our other goals was to demystify the learning process and empower people to take control of their learning. Learning can be a very personal process. Often people will labor under the assumption that they just have to find what works for them. That what works for some people may not work for others - that there aren't really any rules to this. While it's certainly true that everyone has their own unique set of abilities, knowledge, and experience - the basic process of learning is the same for everyone. So while the exact application may be a bit different for each person, there are some guidelines to follow. In other words, finding what works for you doesn't have to be this highly variable, often frustrating experience. Instead, you can apply some basic rules and guidelines and adjust as needed.